The Southern Sierra Partnership (SSP) is an alliance of business and conservation organizations working to protect lands, livelihoods and communities. Our members include Audubon California, Sequoia Riverlands Trust, the Sierra Business Council, Tejon Ranch Conservancy, and The Nature Conservancy. Since 2008, we have served a seven million acre region stretching from the Southern San Joaquin Valley to the peaks of the Sierra Nevada, including significant portions of Fresno, Tulare and Kern Counties. This area contains landscapes ranging from fruit orchards to giant sequoia groves, hosts some of the most productive farmland in the world, and contributes tens of billions of dollars to the state’s economy every year. It is also home to a diverse and rapidly growing human population. SSP seeks to ensure the region’s long term economic and environmental resilience through land protection and land use policy. SSP members are working with elected officials, planners and others to minimize conflict between renewable energy projects and regional conservation goals. 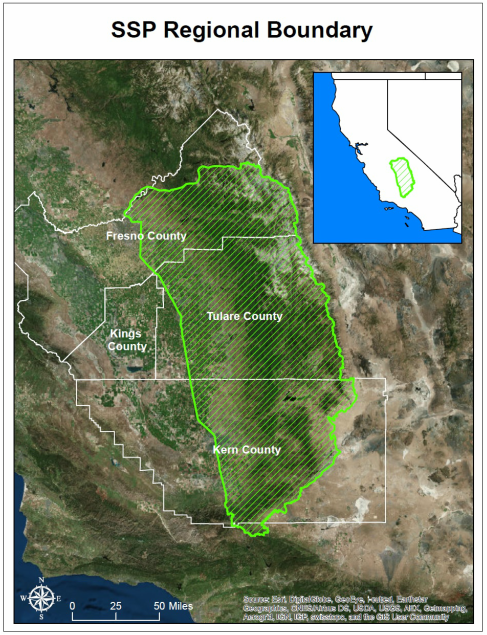 In 2013, the Conservation Biology Institute (at the time, an SSP member) released its Decision Support for Conservation in the Tehachapis and Southern Sierra Nevada. The Decision Support uses research, mapping and modeling to identify the most conservation-friendly areas for wind power and other developments. Photo: John Greening, 2012. Map: Adam Livingston, 2015.